Barcelona have displayed impressive performances this campaign, maintaining their unbeaten record throughout and exposing the finest of plays under Ernesto Valverde. Nevertheless, they seemed as if they were about to savour the first defeat of the season last night, while squaring their horns with Sevilla. Coming off the bench late in the match, Lionel Messi yet again influenced the scoreline with his sublime skills. The talisman presented his side with a sensational equaliser in the final moments of the match, preserving his side’s unbeaten run in the process. The 30-year-old was benched due to continued muscle discomfort, which had kept him from operating in the international friendlies against Spain and Italy. However, with his team trailing by two goals, the illustrious gaffer called the Argentine into action in the 58th minute, displacing Ousmane Dembele. Although the phenomenal forward was unable to mark any major advancements early on, the Catalan team started pushing forward as the game bordered its conclusion. Then finally, Luis Suarez pulled one back for the Spanish giants with an acrobatic touch in the 88th minute, succeeding a corner. It was soon followed by another goal from the prolific Ballon d’Or laureate. 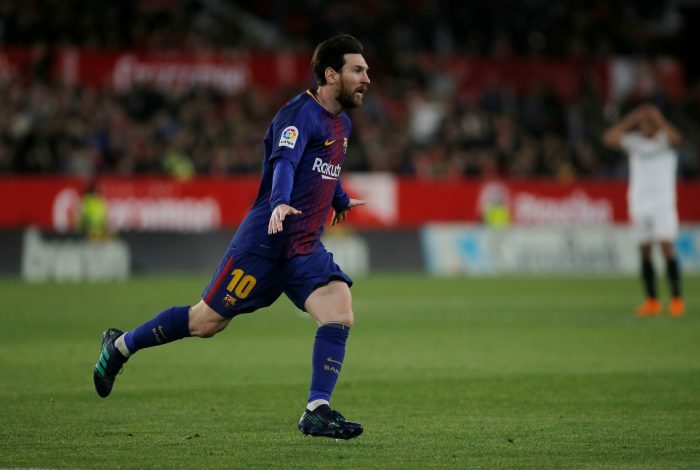 Only a minute had passed before Messi netted in a left-foot strike, marking his side’s second goal after the Uruguayan’s stunner, extending the Catalans’ unbeaten league run to 37 games. Eluding a defeat in their next fixture against Leganes at home would equal them with Real Sociedad’s Liga record of 38 games without defeat, which has stood since 1980. Nonetheless, the Argentina international’s jaw-dropping performance has attracted a great deal of attention, as the supporters jammed Twitter with countless reactions.